GETEX has completed a two-month project on the former RAN destroyer, HMAS VAMPIRE, surveying it for asbestos, lead paint and chromate-based paints and managing asbestos removal. These hazardous materials were still in use when a HMAS Vampire served in the Royal Australian Navy, from 1959 to 1986. The old warship, the last of the destroyers armed with big guns prior to the introduction of guided missiles, is now a popular feature at the Australian National Maritime Museum where the potentially harmful materials pose no threat to the visiting public. The museum has been progressively removing the asbestos lagging and the remainder is located in the engine room and boiler room areas, safely away from visitors. The recent project also involved further covering and containing the hazardous paints. Launched on 26 October 1956 and rapidly approaching its 50th birthday, HMAS Vampire last year needed extensive repairs to keep it in good shape for museum display. The work, carried out at Sydney’s Garden Island facility over the months from October through to December, included a comprehensive survey and completion of all priority repairs to the hull and structure. Overall management of this project was performed by Thales Australia, a leading defence contractor. GETEX managed the asbestos removal within the engine and boiler rooms and provided Occupational Health & Safety services to Thales Australia in the form of daily asbestos air monitoring and asbestos clearance certificates. According to Thales Australia, Getex played an integral part in assisting Thales Australia to ensure that the works were completed safely and that contamination of surrounding areas did not occur during all stages of the asbestos removal works. By Christmas, HMAS VAMPIRE was back at the Australian National Maritime Museum, ready for the big holiday crowds that clambered on board in December and January. Authorities at the museum said the restoration programme has given HMAS Vampire a new lease of life and GETEX’s work will have long-term benefits. GETEX’s survey of the entire vessel has given improved information on the nature and location of the remaining hazardous materials. 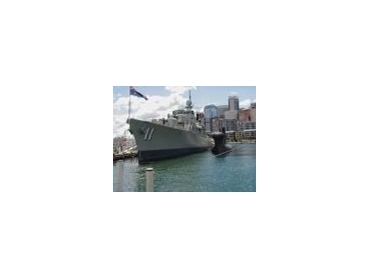 You can board HMAS Vampire and see how it looks following last year’s works programme. The National Maritime Museum, at Darling Harbour, is open daily 9.30am to 5pm.